The attraction to—and growth of—the Flathead Watershed is largely driven by our remarkable natural land and water resources, in particular our clean water. But continued growth puts pressure on the very resources that attract people to the watershed and make life here so special. In the Flathead Watershed, citizens and the environment are dependent upon and affect one another. They continually change and adapt alongside one another. Our decisions today about where and how we build our homes, where we extract and develop our resources, and what activities we pursue on our land and in our waterways will determine the legacy we will leave our children. Almost every human land use puts some pressure on the watershed and has the potential to adversely impact our water quality. 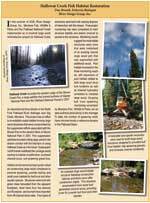 However, the Flathead Watershed has a long history of beneficial utilization and natural resource protection. Riparian areas and wetlands—where land and water meet—are vitally important to the health of our waterways. They are places where physical, chemical, and biological components work together to create some of the most biologically diverse areas in the watershed. Maintaining the integrity of these areas is critical to the long term health of the ecosystem. Wetlands are areas inundated or saturated by surface or groundwater at a frequency and duration sufficient to support vegetation adapted for saturated soil conditions. They include swamps, marshes, bogs, and other similar places. 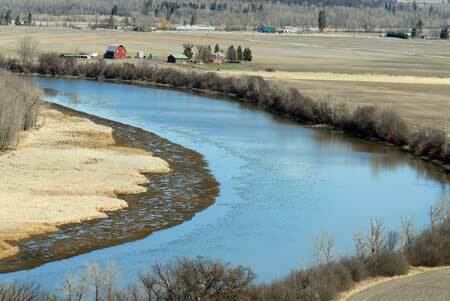 The word “riparian” is derived from the Latin word “ripa,” which means river bank. Riparian areas are lands that occur along watercourses and water bodies, such as streambanks and floodplains. Their unique soil types, sands, gravels and vegetation are strongly influenced by the presence of water. They typically have a high water table due to their proximity to aquatic environments and groundwater. The interaction between aquatic and terrestrial ecosystems makes them highly diverse, dense, and productive. Riparian areas filter out sediment and pollutants—providing clean water for household use, irrigation, and healthy fisheries—and release water for late summer streamflows. They absorb water during floods, thereby reducing the impact of floods. Riparian areas and wetlands also support numerous recreational activities, including fishing, hunting, bird-watching, hiking, and just enjoying the proximity to water. Riparian forests make up less than five percent of the total forest ecosystem, yet they contain 75% of the forests’ plant and animal diversity. In western Montana, 59% of land birds use riparian forests for breeding, and 39% of those birds must have riparian areas to breed. As these breeding areas change or disappear, bird species can dwindle leaving us wondering what happened to all the birds we used to see. Given the relative scarcity of riparian areas in the landscape, they are particularly important to protect. The force and beauty of rivers and the peace and splendor of lakes attract people. We build our homes, grow our crops, graze our livestock, harvest our trees, and play along their banks and shorelines. Because we have established our lives around the rivers that surge through the watershed, we must learn to adapt with them. Rivers, by nature, change the land beneath and around them, and alter their paths and patterns over time. They flow from mountaintops down the sides of rocky slopes, carving canyons and shaping passageways on their way to their final destinations. Sometimes they flood, inundating the surrounding landscape with water. Development in the river corridors and floodplains puts people and property at risk, which in turn causes people to put flood and erosion control systems (such as rip rap) in place, many of which compromise the complex nature of rivers and accelerate downstream shoreline erosion. Over the years federal, tribal, state, and local regulations have been created with the goals of minimizing the effects of development and land use on water quality and wildlife habitat in riparian areas and wetlands, and maximizing public health and safety. 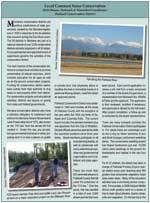 Many common-sense considerations have also been created to lessen the visual impact of development in riparian areas. 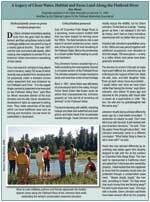 Programs are in place to help landowners with riparian and waterside restoration issues and projects. The combined efforts of citizens, scientists, planners, and land managers can protect and maintain the quality of our resources. Maintain or restore a buffer strip of native plants along river banks, lakeshores, and wetlands. Buffer strips help keep water clean and cool, and decrease erosion. The best buffers have a high diversity of plants and are fairly wide. The steeper the slope, the wider the buffer should be. A minimum of 300 feet (91 m) (as per the Governor’s Room to Roam initiative) should be used, but if that is not possible use the largest possible area. A 200 to 250 foot (61 to 76 m) wide buffer strip is effective at filtering nutrients. If space is limited, the widest possible buffer will still help trap nutrients and other pollutants. Build upland, away from riparian areas and wetlands. Locate buildings on slopes with less than a 20% grade to prevent erosion. Use exterior colors that blend in with the landscape to be the least visually disturbing. Avoid bright lights on the exterior of your buildings so as not to interfere with nocturnal animals. Minimize your building area and keep shorelines and riverbanks free of permanent structures. Divert rooftop runoff into rain gardens, rain barrels or other catchment systems, or onto grass so water will be absorbed gradually. Avoid extensive paved areas and other impervious surfaces near water as they may channel polluted water into waterways. Keep pathways to the waterfront as narrow as possible and gently winding so run-off will not have a direct route to the water. Use wood decking, bricks, pervious paving materials, or interlocking stones for walkways, so water is absorbed into the ground. Avoid draining or filling wetlands. They filter pollutants, recharge groundwater, and provide important habitat for birds and other wildlife. Don’t fertilize in buffer areas, and don’t apply fertilizer on your property directly before or after heavy rain or when plants are dormant. Avoid disturbing wildlife travel routes and nesting sites. 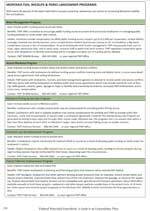 Use natural herbicides and pesticides (as directed) for lawns and gardens. Avoid washing vehicles in an area that could drain to a water body. Maintain and pump your septic system on average every three to five years, depending on use.